Do you look forward to your unsubscribes and opt-outs? Yeah… me neither. I figure if they get on my list in the first place, they are interested in what we make available. So when people opt-out, I always wonder how I could have reached them better or more effectively. I’ve spent many years building systems and methods for how to allow you to engage the people who opt-in. Over the past ten years, we’ve succeeded in developing the #1 inbox delivery platform in the industry. We’ve learned a bit about how to treat your leads, and how to optimize email. So when I see something like this, I just wonder… what are they thinking?! I received an email a few days ago that had a long warning about unsubscribing from his list. I’ve seen this kind of warning before, and now I’m going to speak out. Why? Because I believe it’s a scare tactic, and doesn’t honor the people on your list — and ultimately will not help you get to the inbox, and could actually cause your leads to DIS-engage. OK — the type in the picture is really small… But here’s the thing – it’s misleading, and in my mind a scare tactic. The title of the section of text is, “Fair Warning” — ok — so pay attention, right? Perhaps that is true given the email solution he’s using, that only allows a complete and total unsubscribe, but the truth is, IF you are a customer and the email being sent is delivering something that was purchased, then that is not bound by the CAN-SPAM laws. CAN-SPAM is for marketing and sales-related emails. In your customer terms 0f service, you can state that email will be used to deliver the product and any customer update notices — so you make it very clear to the customer. But that customer must also have the ability to opt-out / unsubscribe from receiving marketing & sales emails from you. 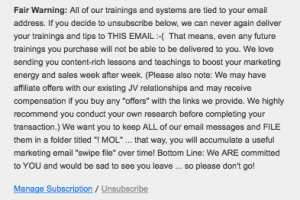 Let’s continue with the next portion: “That means, even any future trainings you purchase will not be able to be delivered to you.” This phrase, if I were a customer, would have me NOT unsubscribe – which is what he wants. However, what I will do is relegate his emails to the dustbin — as they come in, I will look, and delete — UNLESS it is for a product that I purchased from him. Because if I don’t want his endless affiliate offers and to be constantly sold to, I can’t opt-out of receiving them — because there is not a way for me to manage my preferences. And if you haven’t purchased anything from this guy… so you go ahead and opt-out… and then a few months from now you get an offer, it appeals to you, so you take the plunge, and purchase — turns out it’s from this guy (through an affiliate offer since you opted off of his direct list)… but since you opted OFF their list a few months earlier… and now you’ve paid him, you’re not receiving ANY emails about your purchase. Why? Because you purchased with the same email that you opted off his list. Is that customer service? Or is that customer frustration and a refund request waiting to happen??!! The next sentence is an attempt to have me understand how valuable I am on his list: “We love sending you content-rich lessons and teachings to boost your marketing energy and sales week after week.” — yet if I look back on the emails that I’ve received from him — nope — almost all affiliate offers (i.e. increasing his sales week after week). And the next sentence covers that in the parenthetical to the sentence above: “(Please also note: We may have affiliate offers with our existing JV relationships and may receive compensation if you buy any “offers” with the links we provide. We highly recommend you conduct your own research before completing your transaction. )” — which is purely CYA (cover your …) copy for the FTC. He’s telling me right there, that his valuable “content-rich” lessons and teachings are really his affiliate offers, and BTW, you are on your own here. And he finishes up with this: “Bottom Line: We ARE committed to YOU and would be sad to see you leave… so please don’t go!” A final appeal to try and say I’m sorry for sending you my endless sales offers? I want you to know that some of those offers, I appreciate — they broaden my thinking. What I don’t like is the “Fair Warning” statement he’s included at the end of the email that I’ve shared. Tell me what you think about it in the comments below… why would you use this or not? Now… let me tell you why I do not like this – and how, with WPMktgEngine, you don’t ever have to include this sort of statement. Number one – I don’t like the message it delivers to the recipients. It basically tells me, I’ll send you whatever I want to send you, and you have no choice about it — if you want to ever get any product/program delivery emails should you purchase from me (or if you’re already a customer). What is your reaction to that message? Is that the message that you want to send to your leads? Your perfect potential customers? 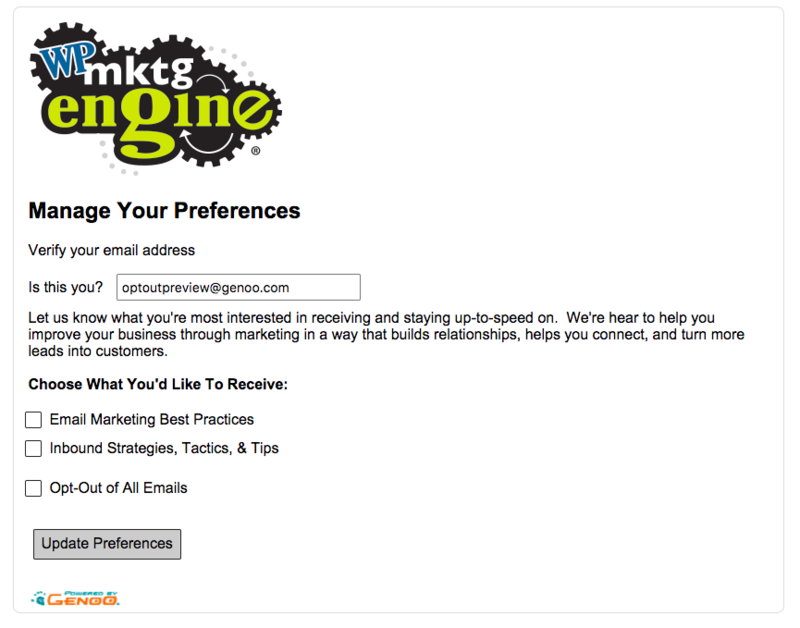 Include a “Manage Preferences” link at the bottom of your emails. Have it actually allow your leads to manage their preferences and tell you what they’d like to receive and what they don’t want to receive. In the example email above, the “Manage Subscriptions” link is the same as the opt-out page, except it has an embedded video at the top, and some other links that try to distract you away from submitting the opt-out. If that’s not manipulation, I don’t know what is! If you care about your leads, DON’T DO THIS to them. There is a difference between marketers who leverage email to build relationships, to make a difference with their recipients, and there are others who just want you to do what they want you to do … on THEIR time, not yours. Ick. And it doesn’t work in the long term. You will wear out your list and your email deliverability will suffer. 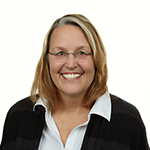 If you don’t want the “marketing as usual” approach — I want to work with you!! Plus, I can make sure that my customers or people who purchase or request downloads, will ALWAYS receive their products — even if they don’t want any marketing emails from me. It’s as simple as identifying the email to send upon a form submit – and identifying that email as a “fulfillment’ email. Isn’t that a better way of serving, supporting, and making a difference with your audience? When you have an email service provider who provides options that honor what the people on your list want, and allow you to easily listen — not just by what they’re telling you but also by their actions (clicks, downloads, etc) — you can engage more of your audience, and not resort to scare tactics to keep people on your list. I agree totally. One of the top coaches has a similar notice: We have your email as xxxxxxx. Let me know if that’s not the best one, or unsubscribe (but careful, unsub means I can’t deliver your emails, even for things you asked/paid for). As always, if you need anything just hit reply – we always got your back. You can reach me anytime at xxxxxx . I have purchased several products that I want access to and attended a live event so I haven’t unsubscribed but…. he typically sends 6-8 emails a month and sometimes more if he is launching something. Most are selling something – mostly his own products or bragging how great he is but occasionally he sends one full of valuable content. I have less trust for him now than I did have in the past and delete many of the emails after a quick read.